Once you decide you want a new mobile device or a computer, don’t forget to buy one with an already installed antivirus. If it doesn’t have something like that, our recommendation is to look for one and get it. Otherwise you won’t be able to enjoy your device for much longer. These days, malicious software is very common. Once your gadget gets infected with it, chances are you’ll lose all your life’s work. To avoid that, we suggest looking at Avast Pro Antivirus. Czech company Avast, once known as Alwil Software, is a privately-owned company that was created in 1988. It’s one of the leading names when the talk about powerful security solutions comes up. Their most recent product is strong and full of great security features. We put it through several tests for this review and we now have some thoughts about it to share with you. To properly make the most of the Avast Pro Antivirus, the product you decide to install it on has to have a couple of requirements. Like Avast themselves say on their official page, “we’re not demanding.” Your computer should come with either Windows XP, Vista, 7, 8, 8.1 or Windows 10. In the case of Windows XP, make sure it’s the SP3 version. Also, you need 1.5 GB of hard disk space and at least 256 MB RAM. For this review we successfully installed the latest version of Avast Pro Antivirus on multiple machines, from Windows XP to Windows 10. The process was every time smooth and easy to perform. The installation runs in the background. Just a small popup is displayed through the entire process. The installation ends with a message about the product activation, you can test it for 30 days or you can add the license details in order to fully activate the antivirus. 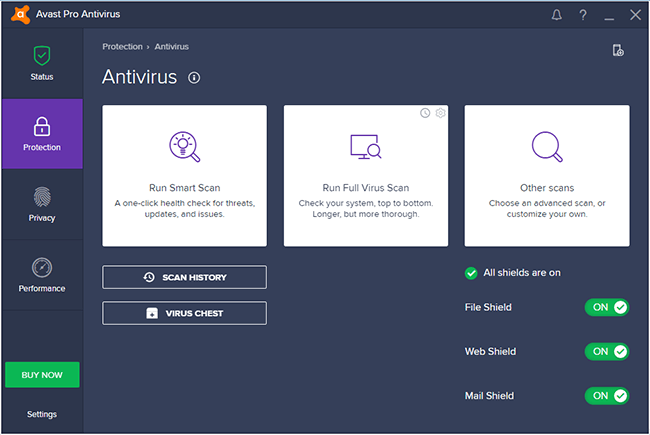 Compared to the previous version, tested and reviewed last year by our team, the latest Avast Pro Antivirus has a series of improvements and additional capabilities. As usual when it comes to the anti-malware apps that we test, we’re going to divide the features into two: important and additional. Sandbox – similar to the ones developed by BitDefender and Norton. It allows the running of potentially harmful applications in a secure environment. 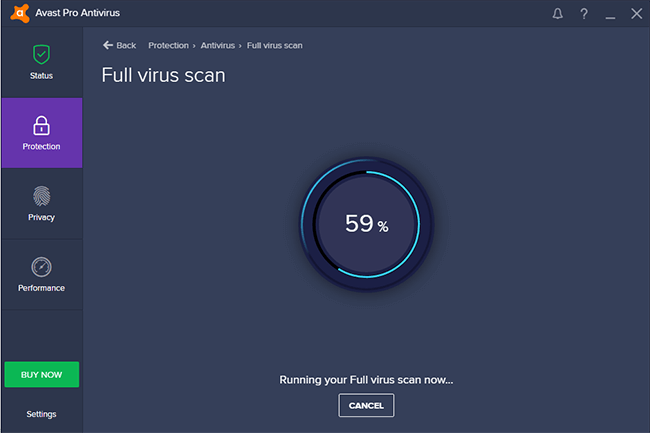 And now, like we always do with all the antiviruses we test, we’ll detail the characteristics of every security module that comes with the Avast Antivirus 2019. One of the main things we test is the reaction speed of antiviruses against unwanted applications or malware from a pre-defined data base. Another aspect we test for our reviews is the speed reaction of a security solution when an EICAR file appears on the computer. This file is used to officially test anti-malware applications. The EICAR file was identified and blocked in less than one second from the moment it was saved. This is great, especially when you compare this antivirus to all the others we tested. 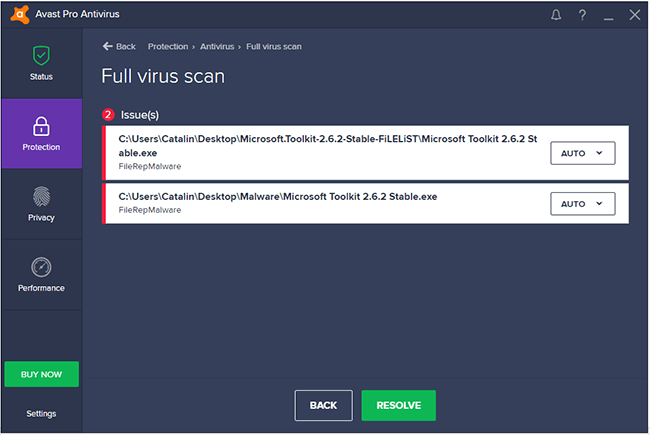 Avast Pro Antivirus shows several options after it finds a file with potentially harmful effects on a computer. They’re as follows: Delete, Repair, Chest or Nothing. We urge you to never ignore the warnings displayed by the Avast antivirus. Also, delete the file that’s been identified as dangerous. Erroneous detection rate is very low, so rest assured that the files identified as harmful are really dangerous. 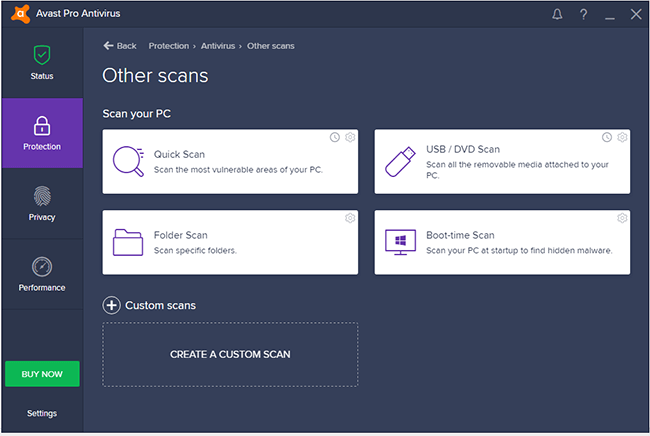 Avast Pro Antivirus 2019 has many pre-defined ways to scan files: Quick Scan, DVD/USB scan, Folder scan and Boot-time scan. Smart Scan is another way to check the entire system. During the process, every major issue a computer can have is identified. These problems can be either antivirus applications that are at conflict with one another, viruses, vulnerable software, browser add-ons with security issues, network problems, performance problems or issues having to do with password strength. 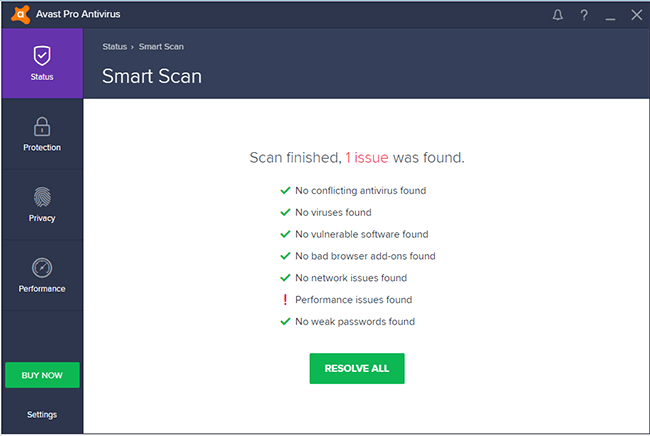 When the scanning is done, Avast will display a report that’s very easy to read, even by a newbie. The “Resolve all” option will take the user to another window. Depending on the problems that appear, you sometimes need to choose a premium security package to solve them. That’s because the Avast Pro Antivirus doesn’t have that option. You can see, in the screenshot below, how the antivirus detected a system performance issue that needed to be fixed. To solve it, you have to buy Avast Cleanup Premium. This one isn’t included in the version you just installed. The scanning speed is very good, although we noticed a small delay in the beginning. That only happened on one of our computers running Windows 7. Detection rate is also very good and it’s up there with the one offered by the top antiviruses we’ve tested so far. 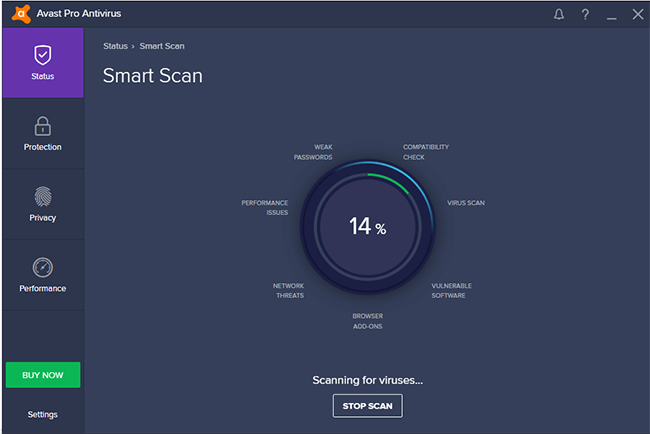 The antivirus module runs using several intelligent technologies, such as Behavior Shield and CyberCapture. If the Behavior Shield uses real-time analysis of apps’ activity, the CyberCapture automatically sends potentially infected files to Avast labs. 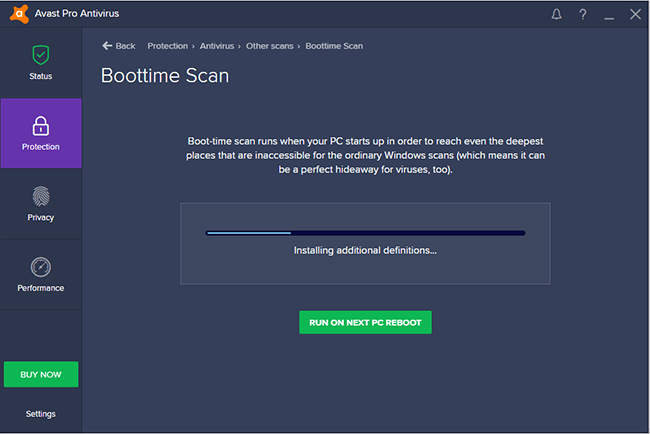 We conclude our talk about the antivirus module with Boottime scan. This one checks the system and files in order to remove viruses as well as persistent malware threats impossible to get rid of while the computer is running. 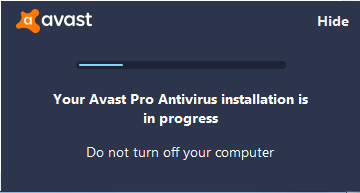 After restarting the computer, the Avast Pro Antivirus is activated. It then begins to scan and remove infected files that appear while the PC is booting. Once the scanning is over, the system starts and you can use it as usual, because the malware threats will have been gone. If you deal with a tenacious virus that’s hard to eliminate, the Avast Pro Antivirus 2019 is one of the best security solutions available. 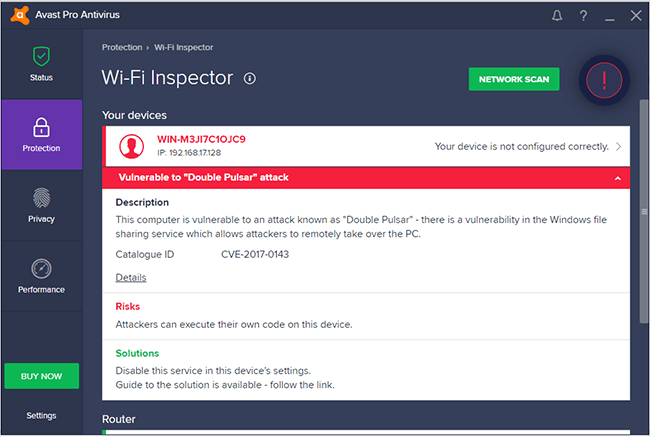 Another feature of the newest Avast Antivirus for PC is the possibility to scan and locate vulnerabilities when it comes to wireless connectivity between devices. Gadgets from private networks are also scanned to look for connectivity vulnerabilities. The feature identifies issues very quickly. You’ll soon see a warning message on the screen. Follow the steps there to solve the problem. 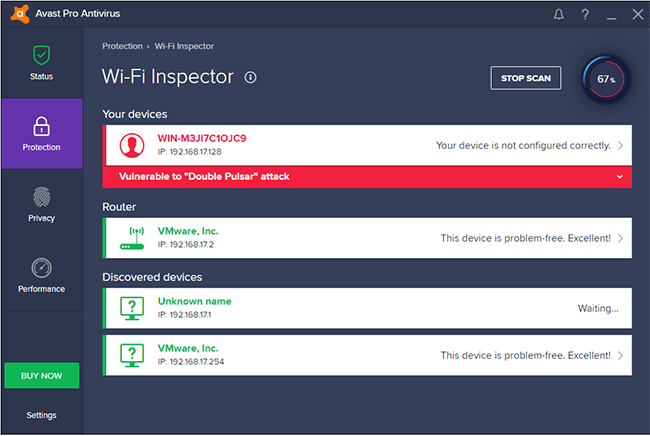 The Wi-Fi Inspector is a very useful security feature. What with the development of wireless connectivity between gadgets, the chances of them being illegally accessed increases. The vulnerabilities found by this feature will better protect connections and deal with devices that belong to a certain Wi-Fi network. A detailed guide on how to solve problems is a very welcome addition. It’s especially useful for users who don’t have an advanced technical know-how. Avast introduces a solution allowing the antivirus to be run from a USB stick or a DVD. If problems appear, like a malware infection, the Rescue Disk will scan the computer and remove all compromised files. For this review, we successfully tested the removal of certain viruses using the method previously discussed. To create the Rescue Disk, you only need a couple of minutes. It will help you avoid a lot of annoyance if your PC is infected with hard to remove malware. 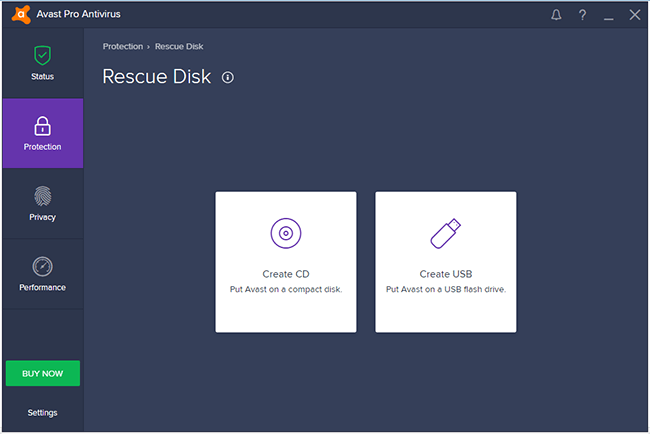 It’s always a good idea to create a Rescue Disk after installing the latest Avast version. Keep it in a safe place after you do that. It’s better to prevent than to suffer from the lasting effects of a problem. It’s well-known that software applications which aren’t updated are vulnerable. 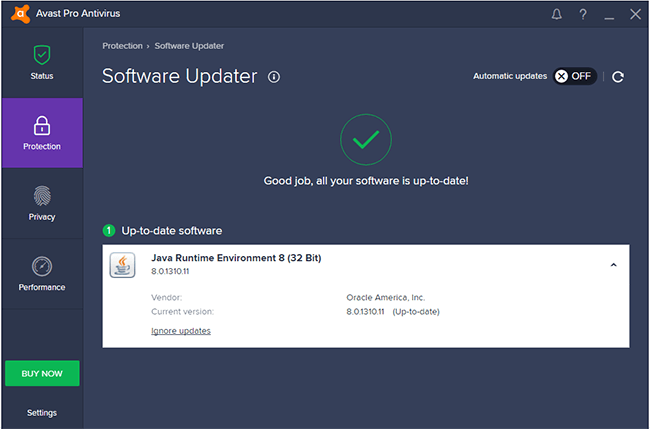 The Software Updater from Avast Pro Antivirus is a step forward when it comes to improving computer security. As the name suggests, this module checks whether or not the applications on a PC are updated. If it finds vulnerable applications that aren’t updated, it will display a message. These apps can then be updated directly via Avast’s interface. The premium version of the antivirus, namely the Avast Premier, also reviewed by our team, can be set up in such a way, that every software update is done one by one in real time. To do that, go to Protection > Software updater and check the Automatic updates option. Once activated, every software update will be done automatically, without the user’s intervention. Phishing-type threats are some of the most dangerous for device users. They can directly affect your income. Phishing is when the user is sent to a website which looks identical to the official one. This false site will then steal the data used for logging in. This is where the module known as Real Site from Avast’s latest antivirus comes into play. How does it work? It checks whether or not the site you’re on is the real one. This is done in real time. Most of the time, the site’s URL shows you that you aren’t on the official website. There are times where hackers modify the .hosts file which influences how users are directed to a site. In this case, the user will see, in the browser, what they think is the real URL. That’s not true, though: you are on a site made by phishing creators. For this review we tested the Real Site app in real time. Our conclusion: it works perfectly, no matter how the phishing happens. This module is activated by default once the antivirus has been installed. We recommend keeping it turned on to avoid possible problems generated by phishing attacks. Sandbox is another useful internet security feature for those of you who want to check if software apps or files are safe. This module has been introduced with the latest Avast Pro Antivirus 2019. It allows the running of potentially dangerous applications in a safe environment where infecting other sections is impossible. The module also lets you open other potentially infected files while at the same time removing the probability that your computer is at danger. Crack-type applications or those without a real digital signature can be run in this environment without endangering the integrity of your PC. 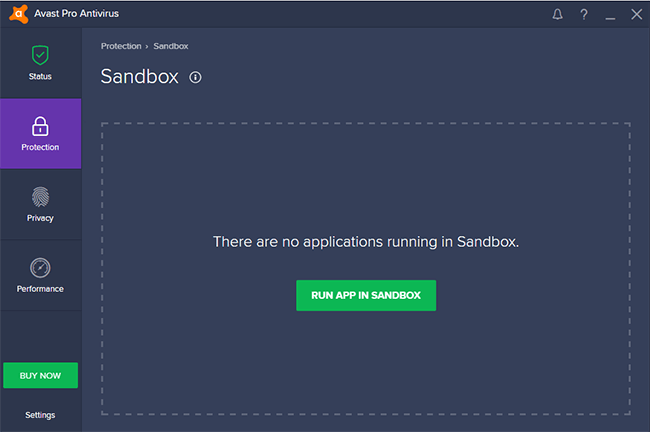 For our review we tested the Sandbox feature and the result excellent. Game mode is a way to improve your PC’s performance while playing games. Have you ever forgotten your login passwords? If you use different passwords for different accounts, you did it at least once. 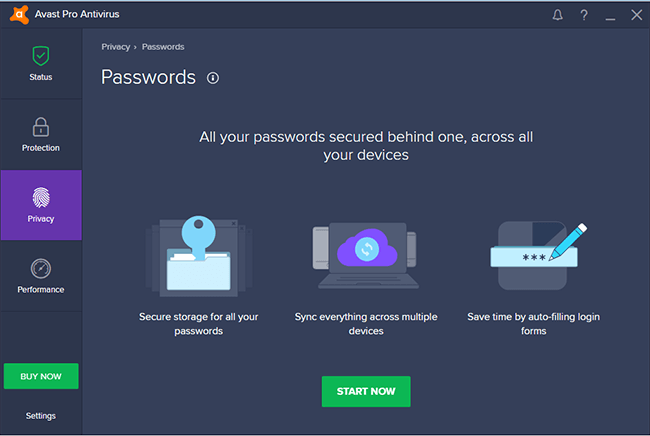 The Passwords feature that comes with Avast has similar capabilities to applications that memorize passwords. The process happens automatically and every password is kept in an accessible keybag that only requires one password master. The main advantages to this security feature? You won’t have to remember multiple passwords and no automatic synchronization between devices using the Avast Antivirus will be needed. Computers that use Windows often get to a point where the OS takes a lot of time to react or the system’s performance isn’t all that great anymore. Cleanup premium is a tool that helps identify and repair the main issues which hinder the speed and performance of your PC. The integrated scanning of the system can take 1-2 minutes. 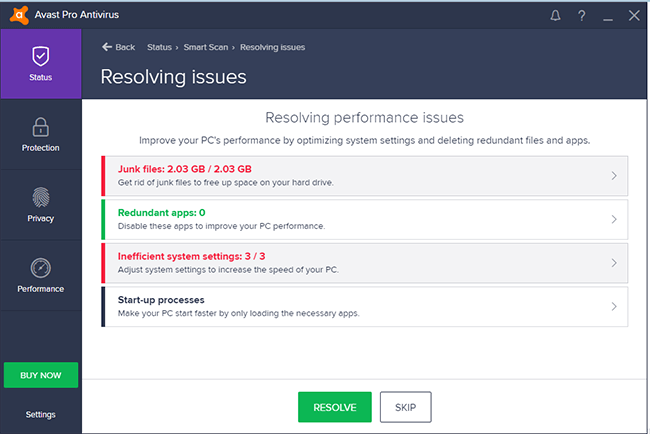 When it’s done, Avast will display the problems it identified and it will offer solutions to remove them. You need to know that the antivirus we’re reviewing today doesn’t come with an integrated Cleanup premium. To benefit from the complete support that comes with this tool, you should get the premium security version of the Avast Pro Antivirus 2019. You can also use this solution for free for a month if you choose the trial module. 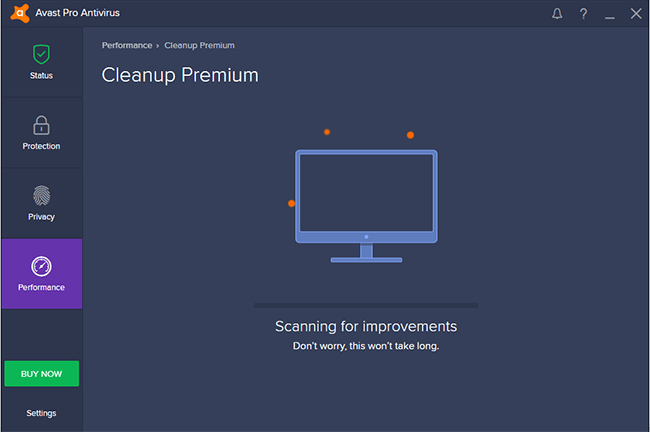 During our tests of the Cleanup premium feature, our team saw that it worked like a charm. 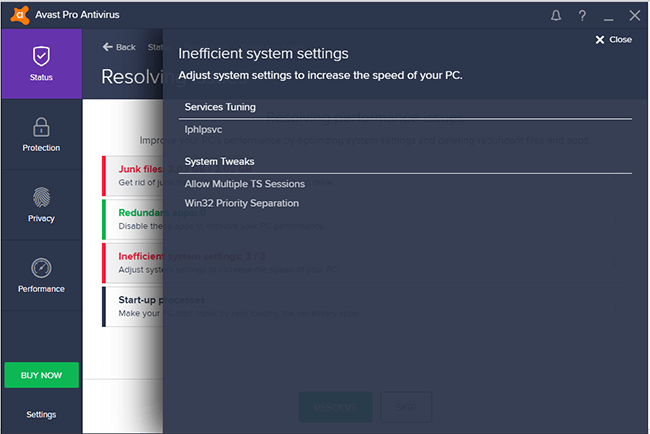 After performing the system optimizations suggested by the Avast Pro Antivirus, our computer improved its performance and the speed with which applications were executed was loads better. 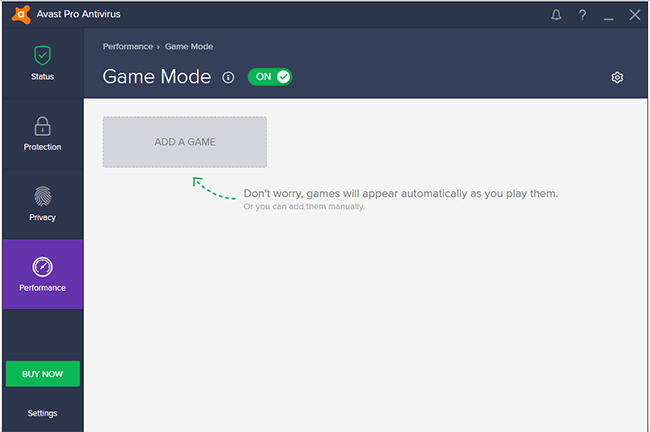 The Avast Antivirus 2019 features a much improved Game mode. To activate and deactivate it, you can use the Performance menu followed by the Switch option. Games can be manually added. They can also be automatically activated once the system that has the antivirus runs them. This feature improves the computer’s performance by reducing the loading generated by other applications running in the background when a game starts. This should happen implicitly by those who manufacture an operating system, but in reality it doesn’t. Avast Pto Antivirus is, once more, the helping hand that allows for superior performance. Other features included in the premium Avast Premier security package are Secure VPN, Data shredder and a very powerful Firewall. 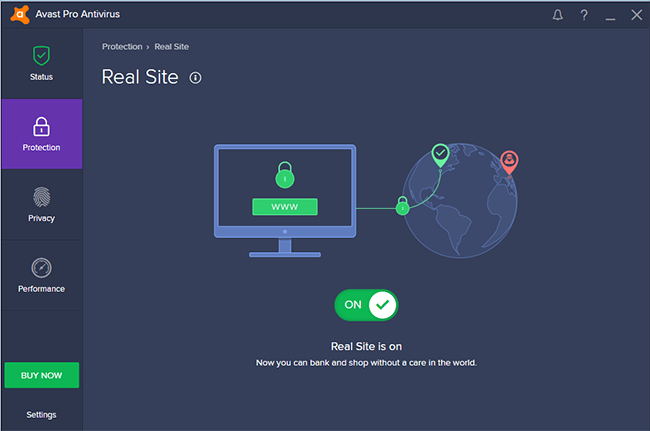 Avast SecureLine VPN offers the possibility for safe connection using another location than the real one. The VPN was fast and gave great results during our tests. Data schredder is useful when you want certain files to be destroyed without the possibility to get them back. They will be overwritten several times until you won’t be able to retrieve them. 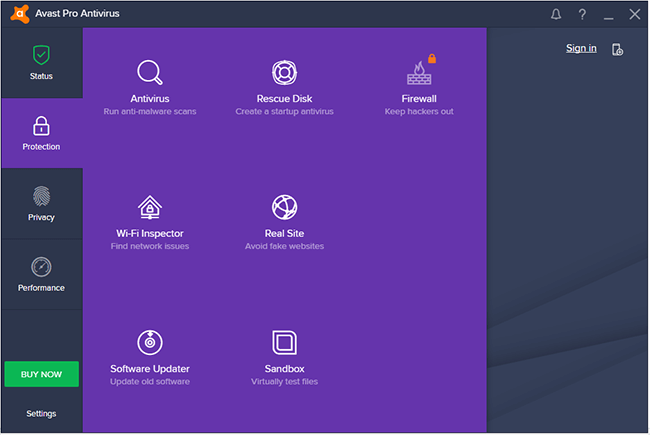 We also tested the Firewall feature which comes with the Avast Premier 2019. Results were in line with other antivirus solutions we previously reviewed. 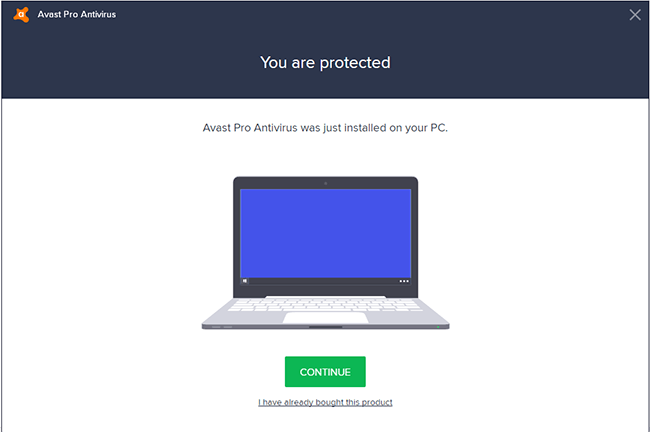 We installed and tested the Avast Pro Antivirus 2019 on several computers with different hardware configurations. Starting from a PC with 512MB RAM and a 1GHz processor to a computer with 32GB and an Intel i7 processor. The impact on resources was insignificant in each case. Even in the weakest configuration that we tested, the Avast Antivirus did an impeccable job without negatively influencing the computer’s speed. If you use an older system or one with an outdated configuration, consider this antivirus as an option. As always, we tested the support team’s speed of reaction, to see if they’re capable of offering solutions to users of the Avast brand. We were impressed not only by the way the support team answered our questions, but also by the speed with which they delivered solutions for our issues. 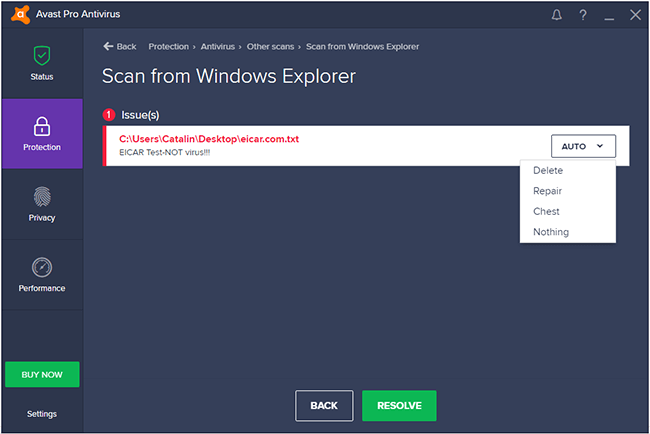 Although they can’t compare to the support offered by BitDefender’s team, Avast manage to do an excellent job. The Avast Pro Antivirus 2019 is $39.99. The license includes complete antimalware protection for a year for one computer. The premium security packages start from $47.99 (the Internet Security version) and can go up to $63.99 (Avast Premier). We can’t say that the Avast Pro Antivirus is the cheapest security software on the market. However, after testing it for our review, we can say that this anti-malware and anti-spyware product is an excellent solution that’s worth the money. Once again, Avast is recognized by the big names in independent testing of antivirus solutions. AV Comparatives, AV-Test and VirusBulletin all give the latest Avast Pro Antivirus with very high marks. These are very similar results to the ones our testing team got. This goes to confirm, once more, the superior quality of this security product. The Avast Pro Antivirus comes with a series of associated products or ones that offer protection for other types of operating system. Avast Security is compatible with Android. The powerful versions that are compatible with Windows are Avast Premier (firewall, file shredder and VPN included) and Internet Security (firewall and anti-spam). The new Avast Pro Antivirus is a powerful and trustworthy security solution. The impact on system speed is reduced. The detection and malware removal rate is very high. Overall, we can say that the Avast Pro Antivirus is an excellent choice for users who want to benefit from maximum protection against threats. Avast Pro Antivirus 2019 is an excellent security software solution. 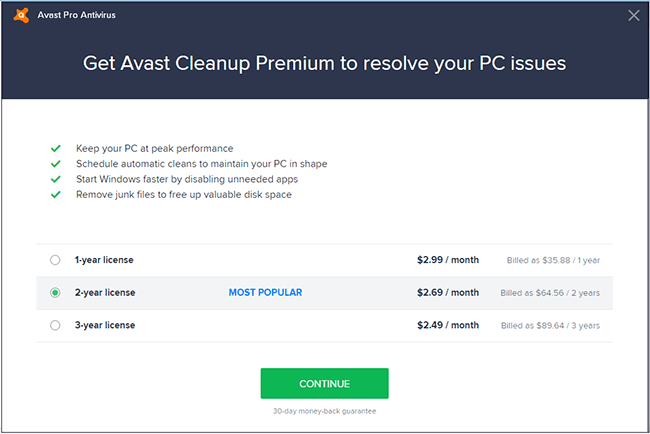 Does the Avast Pro Antivirus 2019 sound like a viable option for you and your PC? The version we tested and reviewed can be yours at a good price. For only $39.99 per year, you get complete antivirus and antispyware protection. If you want better security solutions, you can opt between Avast Premier (firewall, file shredder and VPN included) for $63.99 or Internet Security (firewall and anti-spam included), available for just $47.99. Due to an increased number in cyber attacks in the last couple of years, staying protected against them should become a priority for every computer owner. To benefit from extended protection, we suggest installing and using the Avast Pro Antivirus 2019 as soon as possible.